Hematite is one of the most prevalent and useful forms of iron on our planet. It is a common iron ore and is often used in jewelry and other decorative items. I like its appearance: silvery smooth and shiny, but mostly I love the rounded blobs called a botryoidal crystal habit. So let’s start there, with some controversy. Crystal habit may be most easily described as the shape a mineral takes in a mass or aggregate of many crystals. Individual crystals are often rare in the mineral world, but because of the bonding of the chemical elements that make up each mineral, specific shape patterns form even when individual crystals do not. Habit relates to, but is different from the crystal system, which describes the way the chemicals of a particular mineral form individual crystals in solid geometric patterns. Botryoidal habit is often described as looking like a bunch of grapes. In this instance, the reniform habit of the hematite specimen was called kidney-like. A little research revealed yet another globular habit: mammillary. Alas, the only real difference among them is in the size of the blobs. Botryoidal is the smallest and mammillary the largest, often occurring as just two twins; the name in reference to its “breast-like” appearance. 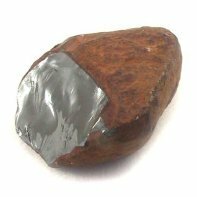 In spite of its iron content, hematite is not considered magnetic in the way most associate the term. However, hematite is considered antiferromagnetic, and has to do with the arrangement of the electrons in its atoms. Those “singing Hematite magnets” or magnetic jewelry is synthetically produced and bears the name hematine. Hematite has a variety of uses. It is very popular for jewelry, especially beaded necklaces and bracelets. The metaphysical properties of hematite (protection, mental clarity, improved focus and concentration) may increase its attraction to wearers. When Finely ground it is used with clay and chalk to create red and yellow colors.